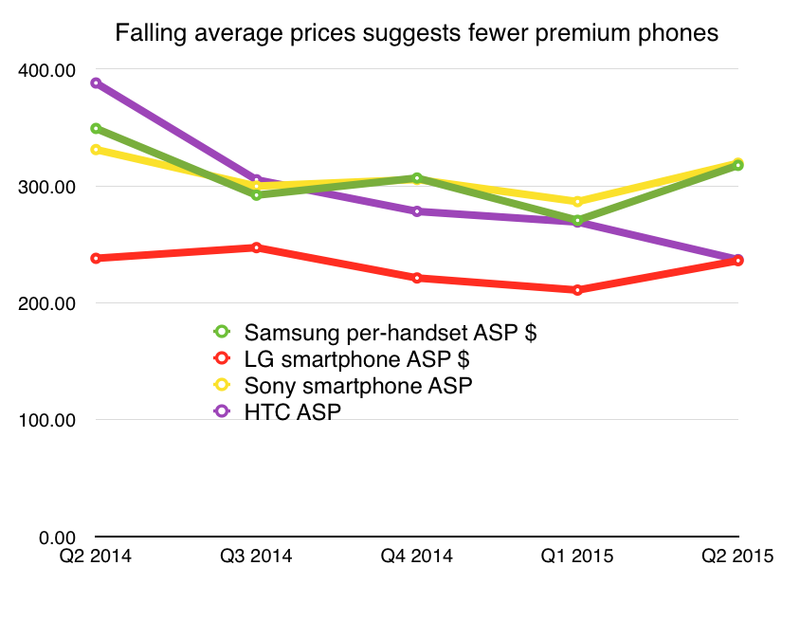 Premium Android phones went off track in the second quarter. Photo by -Jeffrey- on Flickr. It’s late, yes. But all the results are now in for the second quarter (April-June) of the smartphone business. The TL:DR: high-end Android OEMs had a terrible second quarter. The smartphone business generally grew less quickly than for a couple of years as China stagnated overall. But not for Apple; by contrast, it grew strongly. Samsung’s Galaxy S6 did not impress the punters. LG’s G4 sold less well than apparently the company hoped. Sony had a torrid time. HTC then redefined torrid. Premium Android has a real, immediate problem. A year back, in the second quarter of 2014, the combination of Samsung, HTC, LG, Sony, Motorola and Lenovo together shipped a total of 129.4m smartphones. (Samsung shipped 74.9m of them, or 58% of them.) The whole smartphone market constituted 301.4m devices, so that group had 43% of it. In the second quarter of 2015, the combination of that same group (with Motorola now owned by Lenovo) shipped a total of 114.7m devices. Samsung shipped (an estimated, as always) 73.2m, or 64% of them. The whole smartphone market was 337.2m, so that group had 34% of it. • None of the Android OEMs shipped more handsets than in the year-ago period. • None made more operating profit than in the year-ago period. Quite a few lost money, including Sony and HTC – in the latter’s case, enough that its future as an independent company is in serious doubt. HTC: all revenues from smartphones – zero from the Nexus 9 tablet (pretty certainly true), zero from the HTC Re camera (probably true). The shipment figure comes from IDC, so is definitive. Sony: all revenues and profits from smartphones; zero from tablets – of which it shifted fewer than 1.6m, given IDC’s numbers; and zero profit from tablets. LG: $100 average selling price for the 1.6m tablets that IDC says it shifted in the quarter (and it seems to have a range of eight). Tablets assumed to have zero profit, though they might have made some loss that made everything else look worse. Samsung: featurephones (it shipped 15.8m) sold for $15, zero profit; tablets (7.6m) sold for $175, zero profit. If the tablets or featurephones made any profit, then the profit from smartphones were lower. Lenovo: assuming the 2.5m tablets it sold had an ASP of $100, and zero operating profit. If the tablet ASP was lower, Lenovo smartphone revenues were higher; if the tablets were profitable, per-smartphone loss was greater. Microsoft Mobile: the figures here have to be backed out from the headline smartphone revenue ($1.23bn) and stated gross margin (-$104m). Microsoft shipped 19.4m featurephones; assume they had an ASP of $15 and made zero profit (same as with Samsung). The Lumia ASP has to be estimated, but seems reasonable. Perhaps, although HTC’s problem might be that the product is underwhelming. It’s the same product it’s been making for three years; nothing has changed. Meanwhile Sony can’t get the distribution: carriers seems to be edging away from it, and you have to go back to Q1 2012 to find it shipping fewer phones. And LG – despite having a great camera in the G4, which is usually what sells a phone – doesn’t seem to have broken through in a big way. And yes, that really is an operating profit of 1.6 cents per phone. Samsung seems to have had the same problem: its Galaxy S6 and S6 Edge have sold below pretty much everyone’s expectations (especially those who gave it an overheated welcome for its iPhone-alikeness – which I never thought would be a selling point; who wants faux for the same price as real?). Note that the total number of handsets from the listed Android OEMs is down in 2015 compared to both previous years, despite the smartphone market being bigger than ever (figures from IDC). I’ve left out “Others”, which are principally lower-end Android phones. The only one that’s doing better is Apple: not only is it selling more handsets, its average selling price (ASP) of $660 was one of its highest ever. It’s clearly not chasing the low-end buyers (or if it is, it’s not finding them). 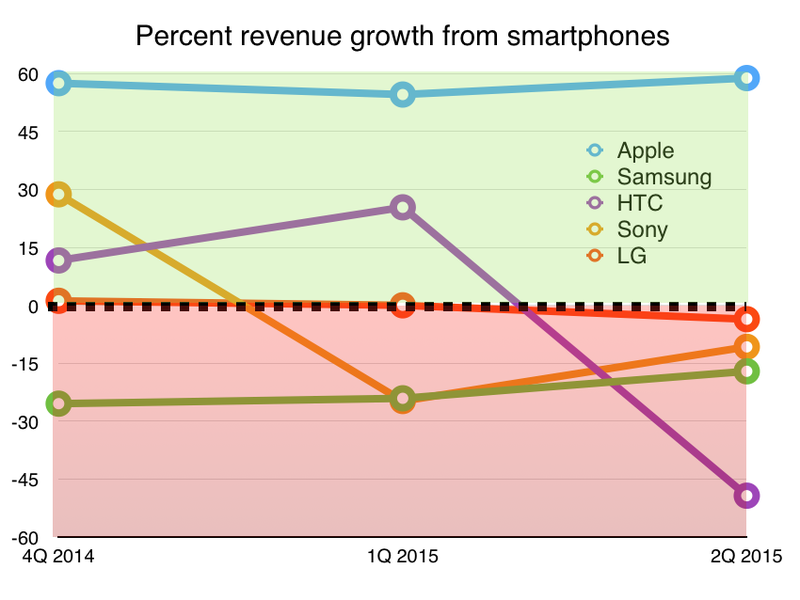 A clearer way to see this is to graph the growth in revenues from smartphones for these companies. Apple has seen 50%+ revenue growth from iPhones in the past three quarters; rivals have faded. Note that they’re all lower than the year-ago period. Add slowing revenues, and you get a picture of fewer top-end phones sold. And now add Apple: note how its ASPs have risen. There’s a contrast with rivals. This makes it pretty clear, I think, that Apple is cruising ahead, while the others are struggling recently. Lenovo/Motorola isn’t included because its figures aren’t comparable year-on-year. And in the west, there isn’t the same appetite for continued upgrades that there was; people are upgraded out. Does the Galaxy S6 really offer anything special over the S4 or S5? If anything, Samsung has pared back on both the software and hardware features – it doesn’t have some of the weird things where you waved hands to scroll screens, nor the microSD card and removable battery that a number of previous Samsung buyers liked. As I said before, Samsung must know how many people actually use the removable battery. But maybe that’s like buying a car with airbags: you don’t expect to need them, you just want to know they’re there in an emergency. and that’s just this year’s models. The Galaxy S5 and Note 4 from last year are still on sale. Samsung seems to be trying to segment demand by not making the Edge Plus available in the same places as the Note 5. I don’t think the crash in premium Android sales is a one-off. The competition from low- and mid-priced devices is fierce now, and yet these companies don’t seem to be putting any clear blue water between them; they’re not offering anything better than they did a year ago. Case in point: Samsung’s Galaxy Note 5 has a smaller battery, also non-removable, than last year’s Note 4; and no SD card – which has pissed off some former Note buyers. How does that compete against the Xiaomis and Oppos and OnePlus phones of this world, which are much the same spec for less? Or even the iPhone 6 Plus, which has a better-adapted app store, and costs less? More than ever, the smartphone business is turning into one where only two companies make money from handsets – and increasingly, only one gets the top-end business. For the rest, they need something new to come along that they can get into and make some profit. Android Wear smartwatches don’t seem to be setting the world alight; will VR be the next big thing? Or IoT? Or self-driving cars? At this point, anyone that isn’t Apple or Samsung seems to be praying for a miracle. Update: there’s a discussion on this post at Hacker News. This entry was posted in journalism by charlesarthur. Bookmark the permalink. The words “premium” and “Android” go together like oil and water. Just saying the two together cracks me up! High-end Android has meaningfully translated raw specs into better user experience until around 2013. After which increases in specs for the high end brought very little to the real world table, while the low end devices heavily caught up in to deliver “good enough” level of performance. Absolutely correct – thank you. Not an analyst … So not going to tell you what this means for next year … But Apple’s big jump in ASP seems to be a function of the 16/64/128 GB configurations. Proportionately, sales of 16 and 128 GB machines were on glide path, but there was a big jump in 64 GB phones. Duh … folks who were on the fence about spending an extra $100 for a 32 obviously bit when it was a 64 GB device instead. I’m not sure if this was subterfuge marketing from Apple, or if it was just a function of chip supplies. But it worked, and it’s a stunt that they could pull off again, maybe with something other then just memory. How does a company sell twice as many phones as Apple and still not make a profit? It makes no sense that Apple makes that much money on selling less devices than Samsung unless there are some other manufacturing/shipping and other logistics we are not seeing here. 1) Samsung sold (an estimated) 73.2m smartphones v 47.5m for Apple – so Apple sold a third fewer. 2) Fewer devices, not less. Less coffee, fewer coffee beans. 3) Samsung does make a profit – estimated here at $33.33 per handset, more than any other Android vendor we know of. 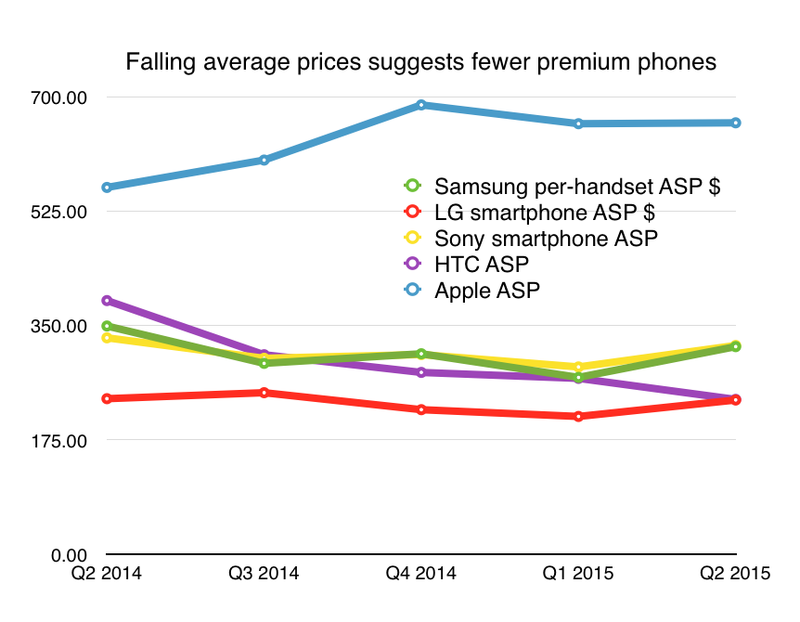 It’s less than Apple’s because as the ASP implies, there are lots of cheaper phones. The cheaper ones generate less profit. There should actually be economies of scale from making/shipping more, but of course you have to get them to the right place. The figures here include marketing/shipping and other logistics costs (that’s implied in the term “operating profit” supplied by Samsung). Samsungs new devices are less capable than the previous generation in many respects (no SD, no removable battery, worse battery life than previous models), HTC devices are getting bigger and uglier, Sony when you can find devices are so fragile the glass is cracking on peoples nightstands, LG devices were expensive. And all of them where introducing a complicated mix of models and specs so brand loyalty was being punished. Apple meantime stuck to a predictable schedule and delivered solid features (even if their marketing hype pretends they invent a lot of things, as opposed to merely better marketing!) and they keep their OS clean – no OEM or carrier bloat/spyware eating battery and stealing storage. The fragmented nature of the Android market isn’t helping them either… they add niche features like the Edge side notification area but apps don’t use it so it’s a waste. Then when folks like One Plus rock up and deliver the same (or better) specs for 3/5ths of the price the smarter segment of the early adopter crowd defect and the halo effect the big brands need goes out the window. Isn’t Motorola trying to get into this space of premium/useable feature set at cost conscious prices? Yes, Motorola (under its newest owner, Lenovo) is certainly doing that. Indeed it was one of the first to head that way when owned by Google with the Moto E/X/G, and definitely succeeded in offering phones with good features at very attractive prices. Motorola’s constant problem though is that it can’t make an operating profit. Since it was spun off from the Big Motorola in the first quarter of 2010, it has had (by my count) exactly two quarters when it made an operating profit – both of those in 2010. I’d say, on balance, that other companies are doing the “premium features at cost-conscious prices” game better than Motorola. Firstly, whilst I appreciate your angle is on the profit margins of large corporations which is important to some, surely there is a major achievement here which is not being celebrated? Great phones in the hands of the masses, you can nitpick about the OS or the build quality but in many cases this is reaching near flagship levels on devices a third of the price of others. Secondly, do you see some kind of doomsday scenario for the consumers of these devices, why are any of these companies still making android phones, why haven’t they given up and moved onto other product lines which actually make them profit? Do you see that as the next logical step or is there some kind of Kingsman-style Valentine plot in the offing? Why should the general man in the street care about Apple or Samsung’s profits? Because they have huge investments in making smartphones: factories, contracts, shipping contracts, employees. These are not enterprises into which one enters with eyes closed, nor leaves lazily. Look at how BlackBerry is still clinging on to the rump of a handset business; look at how Microsoft continues despite losing a ton of money. Also: because there isn’t any obvious space at the moment to move into preferentially. And: expertise in making smartphones should pay off for the internet of things – same technologies apply in many cases. I doubt they do. But they see the effects of those profits in the form of phones that are cutting-edge in manufacturing expertise, features, software and distribution because those two companies make the profits that allow them to reinvest in those things. If you don’t make a profit, or the relevant part of the business doesn’t make a profit, you’re not going to invest heavily in it. Actually, Randy, it does. The second meaning in my dictionary for “torrid” is “full of difficulty”. It’s a British meaning, but then I’m British. My first guess was that you were mashing “terrible” and “horrid” into “torrid”. “Sony and HTC had a torrid time” sounds quite amusing in the U.S., suggesting that the two companies were making out in the back of the bus or something. But if your usage is kosher over in the U.K., then so be it! I can now say I learned something today. So, the dumb f—s simulaneously market on the basis of ‘We’re not Apple’ and remove the main thing that was actually good and useful about their not being Apple– upgradable memory and replaceable batteries– and now they’re wondering why their little bundles of hackable joy aren’t just flying off the shelves. Wonder if these organizations will ever be able to copy the spirit of Apple. Focus on creating few insanely great products; revenues and profits will take care of themselves. The Achilles’ Heel of the all high-end Android players is software. All of them are hopelessly dependent on Google to survive and whatever customization or bloatware they or the carriers put in their devices and spotty updates actually make the end user experience even worse regardless of the underlying hardware. Yet on the other hand, Motorola and Xiaomi proves that you don’t spend astronomical amounts on bleeding edge hardware to enjoy a good enough Android experience. It’s the race to the bottom PC cycle again, v2.0. Curious on your thoughts about the Nexus 5X and 6P announcements impact on the premium Android market. My layman’s perspective is that further price pressure caused by the Nexus line will further hurt the premium market. The Nexus lines tend to sell in small numbers – perhaps a million or so? – but they are likely to cream off the top-end buyers who really care about the software experience. Notable that they are pricier than in the past. But you’re right that they contribute to downward price pressure on the premium makers.